Bird Streak Video Kiddie Ride is a coin-operated children's kiddie ride machine that play the mini game in the video by the steering wheel. The capacity design two seats for players, supports two players enjoy entertainment at the same time, the game designs multiple mini games for option, players play the mini video games by the steering wheel, while enjoy the kiddie ride game. Machine appearance is the style of great bird design, decorated with bright flashing LED lights, the color is gorgeous, the modelling is lovely, will catch everyone's eye. 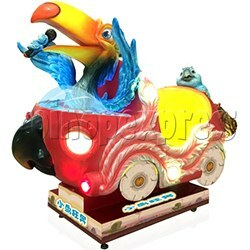 About Bird Streak Video Kiddie Ride, players sit on the seats, insert coins into the coin entrance, choose the favorite mini game by the steering wheel and press button to start the game. During the game, as the music sounded, machine swings in different directions, player control the car in the video game by the steering wheel, players get double entertainment.